students and silverback scientists like network analysis and its applications, more needed to be done to familiarise decision-makers and stakeholders with the network perspective and what it offers. Networks are an entertaining way to model life, both nature and society: quantitative enough for the mathematical- minded, complex enough for the physical-minded, realistic enough for the biological-minded, visual enough for the artistic-minded and simple enough for the non-necessarily-scientist-minded (i.e. for ordinary people). Networks help to link various kinds of data and connect different disciplines. The dream is that networks will help also to link scientists to society. 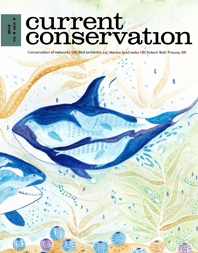 This special issue of Current Conservation can help. If many kinds of people read it, we will be satisfied that we achieved what we set out to do. Enjoy the contribution of some great experts in the field and do not forget the art in the background.